Back in the summer, I started a subscription to Book of the Month when they had a $5 promo deal. I was so excited to find new books and authors and have a diverse selection of beautiful books lining my shelves. But here’s the thing, I found that and more. This is not an ad, it’s a confession. I selected my books every month and often added in previous titles at the amazing discounted price. I have beautiful books lining my shelves and even got a copy of Calypso that I can’t wait to bring with when I see David Sedaris at my local theater next month. What I didn’t think about, which was very obvious, was how much time I really had to devote to reading another selection of titles. I am so very lucky to have the opportunity to read books before they are published and select the titles for the Library. I literally sit in a building that has over 30,000 titles that I can pick up at literally every moment of my workday. I buy books for myself every chance I get. My physical TBR was made unattainable by starting BOTM. It’s amazing. I love it and I love the books. 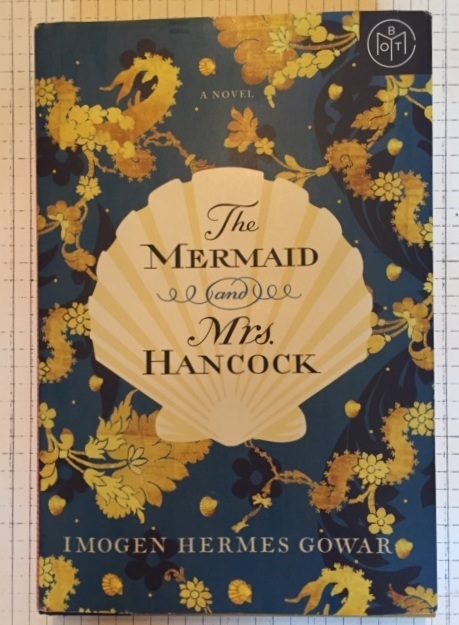 Back in September, one of my selections was The Mermaid and Mrs. Hancock by Imogen Hermes Gowar. Set in 1785 London, we get to follow the lives of businessman Jonah Hancock, courtesan Angelica Neal and a mermaid, and how the three of them are thrust onto an unlikely path together. After unexpectedly receiving a mermaid from one of his ship’s captains, Jonah is intent on making back the money lost by the captain’s foolish investment. Working with his niece Suki, they display the mermaid to great fanfare and it quickly becomes a sensation. After catching the eye of local madam Mrs. Chappell, the mermaid is commissioned for display at her brothel. It’s at the opening night of the mermaid’s exhibit that Jonah meets the beautiful and desirable Angelica Neal. Newly single and in need of someone to care for her-or pay her bills, whatever-Angelica quickly latches on to Jonah. But the evening doesn’t go as planned for anyone involved. What will follow is a story of lust, greed, and unexpected friendship. This story was wonderful! The writing is very witty and I really enjoyed getting glimpses of the everyday life of Angelica and the other courtesans.And poor Jonah. That guy just couldn’t seem to catch a break. First his captain sells Jonah’s ship to buy a mermaid, then he has to make back his lost investments, deal with an unreasonable sister, and the whole time he just doesn’t want to make anyone mad. Slight spoiler on Anglica-you were warned: Her character grows so much over the course of the book. She begins as this spoiled and arrogant person who needs to be surrounded by beautiful things in order to be happy. But she’s never really happy. She is so out of tune with the world that she truly has no idea what trouble she is in or how to save herself that it’s almost sad. When she is finally offered a safe and happy home, she does an extraordinary amount of growing up and realizes that she can find happiness in simpler things. I still have no clue what the mermaid was at the end. No clue. I reread and reread and someone please tell me what that was! Because-buckets? Huh? And I’m very serious-what do you think it was? But I loved this book and the characters and I really got drawn into the story and couldn’t put it down.